2017 Yukon Quest International Sled Dog Race travels 1,000 miles to Fairbanks, Alaska. The 34th Yukon Quest International Sled Dog Race began February 4, 2017 in Whitehorse, Yukon Territory, Canada and will finish on the frozen Chena River in downtown Fairbanks, Alaska. 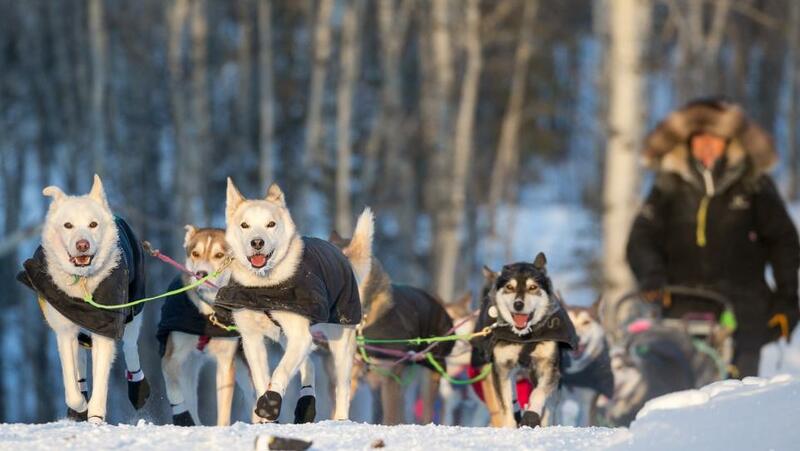 Dog mushing is The Official Alaska State Sport, with The Yukon Quest and The Iditarod being Alaska’s premiere mushing events. The Yukon Quest Trail follows historical gold rush and mail delivery dog sled routes. Once the transportation “highways” of the northern frontier, the Yukon Quest Trail now comes alive each February with the frosty breath and haunting howls of dog teams consisting of one human musher and 14 canine athletes. Race participants are following a 1,000-mile trail that traverses some of the most sparsely populated and most remote and pristine country on the North American continent. Temperatures can vary dramatically from 80F to 30F. High winds and whiteout conditions, rough gravel, hard packed snow, frigid open water, mountainous terrain and river flats can speed up the race or slow it to a crawl. Mushers driving sleds loaded with 250-300 pounds of gear are challenged by changes in elevations as they climb windy and drifted mountain summits, and the sheer distances between checkpoints, some over 100 miles.